She would have made a wonderful queen - she certainly was a splendid princess. Princess Alice was the daughter of Queen Victoria's youngest son Prince Leopold, Duke of Albany. She grew up under the watchful eye of Queen Victoria and in 1904 married Prince Alexander of Teck, afterwards known as the Earl of Athlone, Queen Mary's brother. Renowned for her beauty, elegance and vivacity, she was for the remainder of her long life one of the most popular and energetic members of the Royal Family. In 1923 Lord Athlone was appointed Governor General of South Africa and his wife was at his side through some of that country's most turbulent years. 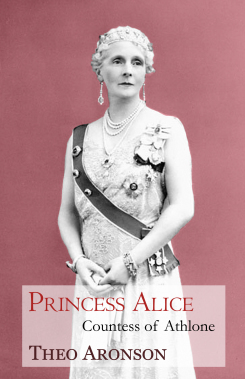 When he was appointed Governor General of Canada during the Second World War, Princess Alice won the hearts of Canadians as well. For many years she was Chancellor of the University of the West Indies and until her death in 1981 at the age of 97 she remained lively and interested in a great variety of social and cultural events.